The definitions of the other two methods will be given in the sections below. Metal provides a protocol, MTLBuffer, for representing an untyped buffer of bytes with a fixed length. Its interface is very similar to NSData. However, Metal buffers are associated with a particular device, which manages how the data is copied during draw calls. We will use two separate static arrays to define our geometry, which is a triangle with red, green, and blue vertices. We will then ask Metal to create buffers that contain a copy of this data, and store these buffers in new properties on our MetalView class: positionBuffer and colorBuffer. You might have noticed that each vertex position is composed of four components, even though we only care about the x and y positions (since we’re drawing a 2D triangle). This is because Metal works most naturally in 4D homogeneous coordinates, where each point has x, y, z, and w coordinates, with w fixed at 1. The reasons for this involve the mathematics of projective geometry, which is a topic for future posts. In order to simplify the math we need to do in our shaders, the points are specified in normalized device coordinates, where the x-axis runs from -1 to 1 going left to right, and the y-axis runs from -1 to 1 from bottom to top. Each color is composed of the familiar red, green, blue and alpha components. Now, let’s look at the vertex and fragment functions that will be processing this data when we draw. Modern graphics libraries provide a “programmable pipeline,” meaning that they allow a lot of the operations carried out by the GPU to be specified by small programs applied to each vertex or pixel. These are commonly referred to as “shaders”. This is a poor name, since shaders are responsible for much more than calculating the shading (color) of pixels. No Metal class actually has “shader” in the name, but by convention, vertex and fragment functions are often called shaders. To incorporate Metal shading code into our project, we need to add a Metal source file to our project to contain the shaders that will process our vertices and fragments. The vertex_main function will be run on each vertex that we draw, while the fragment_main function will be run on (essentially) every pixel that we draw. Each function is preceded by a function qualifier, which signals how it will be used. In this listing we see vertex and fragment qualifiers. There is also a kernel function qualifier for compute kernels. We define a struct, ColoredVertex, that will store the result of the vertex function. The vertex function’s parameters correspond to the vertex buffers we created earlier. The position parameter has an attribute qualifier of [[buffer(0)]], which will map to an index we provide when setting up our draw call. Likewise with the color parameter. The vid parameter is the index into these buffers that corresponds to the current vertex being processed, and will run from 0 to 2 (once for each point in the triangle). The fragment function, fragment_main, takes a ColoredVertex qualified with the attribute qualifier [[stage_in]], which identifies it as per-fragment data rather than data that is constant across a draw call. This ColoredVertex does not correspond exactly to an instance of ColoredVertex returned by the vertex function. After all, the vertex function is only invoked three times to draw our triangle, while the fragment function might be called many thousands of times. Instead, the vert parameter is constructed during the rasterization stage, which determines which pixels are covered by the triangles we draw. This stage occurs between the vertex and fragment function calls. The values at the vertices (i.e., those returned by the vertex function) are interpolated between the vertices to produce the values passed to the fragment shader. This has the effect of transitioning smoothly between colors across the surface of the triangle. Often, graphics libraries require the source of each shader to be compiled separately. Shaders must then be linked together to form a program. Metal introduces a nicer abstraction around shaders: the library. A library is nothing more than a logical group of functions written in the Metal shading language. You’ve already seen above that we have lumped our vertex and fragment function into a single file. This file will be compiled along with the rest of the project, and the compiled shader is included in the app bundle. Metal allows use to easily look up functions by name at runtime as shown in the next listing. Once you have references to your vertex and fragment functions, you configure your pipeline to use them, and the necessary linkage is performed implicitly by Metal. This is illustrated in the following sections. The code above is incorporated in the -buildPipeline method in the sample code. It’s natural to think of graphics hardware as a state machine: you set some state (like where to pull data from, and whether draw calls should write to the depth buffer), and that state affects the draw calls you issue afterwards. Most of the API calls in a graphics library like OpenGL exist to allow you to set various aspects of state. Metal provides a slightly different abstraction of the hardware state machine. Rather than calling API that acts on some global “context” object, Metal allows you to build an object graph that represents a virtual pipeline that takes vertex data from one end and produces a rasterized image on the other end. We’ve already seen part of this in action. By telling our Metal layer which device we’re using, we’ve created one link in the pipeline. Now we’ll discuss a few more kinds of objects that link together to describe the GPU state we want to use when executing render commands: the render pipeline descriptor and render pipeline state. We will discuss color attachments in a future post. For now, just know that the first color attachment (at index 0) is commonly used as the framebuffer that gets rendered to screen, so it’s important that the layer and the color attachment agree on the pixel format. A render pipeline state is an object conforming to protocol MTLRenderPipelineState. We create a pipeline state by providing our newly-created pipeline descriptor to our device, storing the result in another property named pipeline. The pipeline state encapsulates the compiled and linked shader program derived from the shaders we set on the descriptor. Therefore, it is a somewhat costly object. Ideally, you should only create one pipeline state object for each unique shader program you need to execute. That’s why we store it in a property on our view class. Later on, we’ll configure our command buffer with it so it can use the compiled shader program to process our geometry. The code above is the central portion of the -buildPipeline method in the sample code. The renderPass object is constructed exactly as before, except that I have chosen a neutral gray color to clear the screen with, instead of the obnoxious red we used last time. 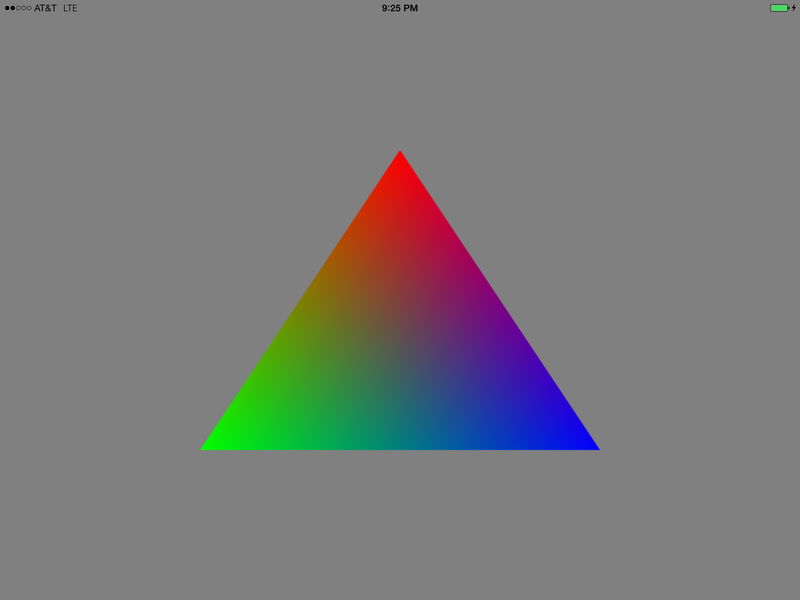 The setVertexBuffer:offset:atIndex: method is used to map from the MTLBuffer objects we created earlier to the parameters of the vertex function in our shader code. Recall that the position parameter was qualified with the [[buffer(0)]] attribute qualifier, and notice that we now provide an index of 0 when preparing our draw call. Likewise with the color buffer index, which was qualified with [[buffer(1)]]. We call the drawPrimitives:vertexStart:vertexCount:instanceCount: method to encode a request to draw our triangle. We pass 0 to the vertexStart parameter so that we begin drawing from the very start of the buffer. We pass 3 for vertexCount because a triangle has three points. The purpose of the instanceCount parameter will be discussed in future posts, but for the time being we set it to 1. These lines round out the new implementation of the -redraw method. Now that our -redraw implementation is complete, we need to figure out how to call it repeatedly. We could use a regular old NSTimer, but Core Animation provides a much better way: the CADisplayLink. This is a special kind of timer that is synchronized with the display loop of the device, leading to more consistent timing. Each time the display link fires, we’ll call our -redraw method to update the screen. This creates a display link and schedules it with the main run loop. If we are removed from our superview, we invalidate the display link and nil it out. In this post, we explored some additional features of Metal and finally got to draw something on the screen. In upcoming posts in this series, we’ll get much deeper into the math and the Metal shading language as we explore topics in 3D rendering. Stay tuned! I have made my metal shaders. However there is aliasing effect along the edges. Thanks for your reply to a question I asked a couple weeks ago. Perhaps you could offer your advice on another issue. I’d be happy to look into this if you can tell me which project you’re referring to, and which hardware and version of iOS you’re running. I was wondering how to supply position values as a float3 instead of float4. Does the vertex buffer need to contain four values each, or can i just convert the vertec to float4 at the shader level? My problem is I’m converting an old open gl project and I have a lot of functions that assume 3 values for position. Would be nice not having to change that and simply makes more sense to me. There are a couple of points here, one obvious and one subtle. The first point is, of course you can use 3-vectors everywhere, as long as all of your code is consistent. The things that have to be in agreement are: your data structures for holding the data client-side and in your shaders, and any vertex descriptors you associate with your render pipeline state. The second, more subtle, point is alignment and packing. If you use a SIMD type like vector_float3 (float3 in C++/shader code), it will still occupy 16 bytes of memory and be aligned at 16-byte boundaries. If your data is actually tightly packed (i.e., a 3-vector is stored as 3 adjacent floats rather than four adjacent floats of which one is ignored dead-space), you must use the “packed” variants of these types when declaring them as struct members. packed_float3, for example, is a type that occupies 12 bytes and is aligned at 4-byte boundaries, which probably fits your use case. I realized I could easily just use a custom struct in object c, my problem was I never changed the vertex descriptors. Thank you for all your help Warren. How does metal know how to interpolate this? Is this an arbitrary struct or does it conform to a standard? If it’s arbitrary would it interpolate *anything* (e.g. nested structs, etc)? By default, all members (including structs contained recursively) are interpolated in a perspective-correct manner if they’re of a floating-point type. Integer-typed members take the value of the provoking vertex for the entire face (so-called flat interpolation). You can read about the various attributes you can apply to a member to get different interpolation behavior here. Great material! I have completed the first 3 chapters and it is definitely helping although I have a very minimal Gfx background! I faced this issue in both the clearscreen and draw the triangle projects, I implemented the code after understanding the material, eventually while trying to Run it, I just got a white blank screen in both the projects. While trying to debug I figured the code goes to AppDelegate after which it goes to ViewController for some reason it wont goto MBEMetalView. After which I copied each file code from each of your github files, still the situation remains the same. On the contrary when I clone and run your project it executes perfectly. Hence, I am at the conclusion this has something to do with some project configuration/setting. I have spent a long time comparing your and mine project and they both seem the exact same. Would you know why is this happening? PS. I did use a very bruteforce method to debug but that is on account of being new to iOS development, new to Metal and new to Objective C.
Hey Anurag, thanks for the comment. I’m very curious to know what might differ between your project and mine. Can you upload your complete project somewhere so I can take a look? Thank you for the quick response! I appreciate how you are still active on this page! I hope it is not something very silly! Fortunately, this is pretty easy to fix. 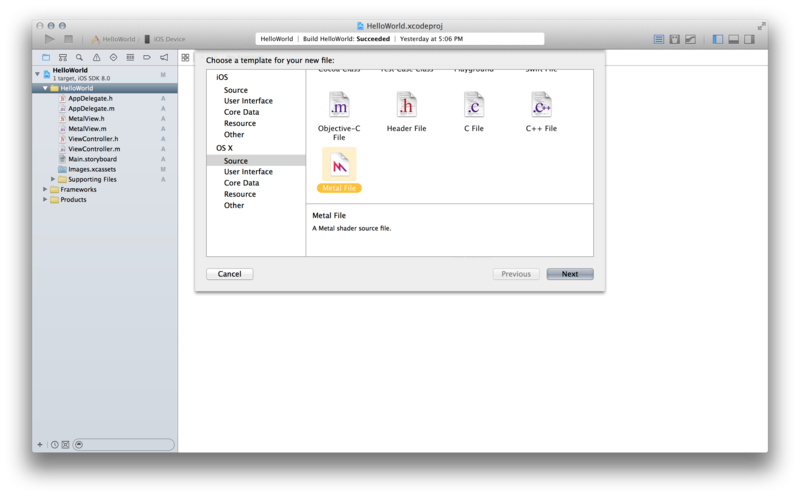 Open the Main.storyboard, select the View, and use the inspector to change its Custom Class name to MBEMetalView. The problem is that it’s currently instantiating a generic UIView instead of the custom subclass. Great! That helped! Thank you! Looking to work through the book.